Typhoon Haiyan may have been the strongest tropical cyclone ever to have come ashore killing potentially as many as 10,000 people, displacing hundreds of thousands of others, destroying a city of 220,000 people while doing an estimated $15 billion in damage. Haiyan arrived less than one year after Typhoon Bopha killed 1,146 and did an estimated $1.04 billion damage in the same area. Bopha in turn arrived about one month after Hurricane Sandy killed 286 people in seven countries and did an estimated $68 billion in damage. The World Meteorological Organization concludes tropical storms killed nearly 170,000 people during the first decade of this century, affected more than 250 million and caused economic damage of $380 billion. According to Kofi Annan’s thinktank, the Global Humanitarian Forum, global warming is causing 300,000 deaths a year and $125 billion in economic losses. Just as Sandy was spawned by Atlantic coastal waters about 3°C hot than normal the Western Pacific has ranged from between 1 and 5°C warmer during 2013 than the 1980-2000 average with the result the region has spawned 81 cyclones, 38 of which were tropical depressions, 30 tropical storms, and 13 hurricanes with 4 of those, like Haiyan, category 5 giants. The Pacific covers about 46% of the Earth’s water surface and about one-third of its total surface area, making it larger than all of the Earth’s land mass combined. Since over ninety percent of the heat attributed to global warming has accumulated in the oceans it is the largest repository of this heat and as the following map indicates produces the greatest number and the strongest tropical storms known as typhoons, cyclones or hurricanes depending on the region of their impact. From this map it can also be gleaned that cyclones rapidly loose their strength as soon as they reach land or venture over cold ocean water. It takes a sea surface temperature of at least 26oC to produce a cyclone and as can be seen from the following map these conditions exist in the northern and southern hemispheres only during specific months of the year. These maps also show that these storms, which are one of the strongest forces in nature, plague some of the most populous and energy hungry regions of the planet. Were we to be able harness this force, we could not only service the energy needs of billions we could prevent death and destruction on a massive scale and the crazy thing is we have the capability to do just that. All we have to do is to emulate Nature’s response to an over heating ocean, which is to convert some of the heat to mechanical energy and dissipate the rest elsewhere. With the laws of thermodynamics dictating that elsewhere has to be somewhere colder. Just as Haiyan left a cooler ocean in its wake, ocean thermal energy conversion can preempt the formation of such storms by converting heat to work and by moving 20 times or more heat to deeper, colder, waters. Detractors point to OTEC’s economics as a major impediment but the law of supply and demand dictates that, in a competitive market, if you have a lot of something, the price of that something should go down and conversely if there is a shortage the price will go up. Ocean heat is the only accumulating energy source on the planet therefore it is an economic opportunity whereas the price of the stagnating and declining energy sources has nowhere to go but up. Assuming of course that the market is competitive, which is hardly the case when fossil fuels, garner a staggering $1.9 trillion subsidy worldwide—the equivalent of 2½ percent of global GDP, or 8 percent of government revenues. Those who are giving away the farm to polluters and thus are facilitating the havoc usually declare themselves to be “free traders” and decry any mechanism, like a carbon tax, that would level the scales upon which their heavily weighted thumbs rest. 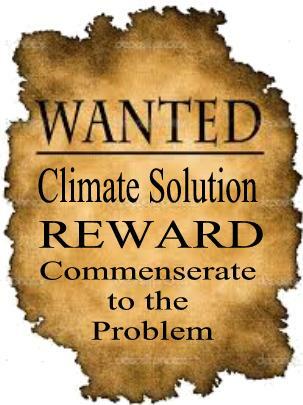 They are usually strong Law and Order types also so perhaps a “bounty” on climate change would be more to their taste? They are also usually big on defence but are blind to the fact that one meter of sea level will inundate 14,000 square miles of U.S. territory with the USGS pointing to the potential for as much as 80 meters of rise with a resultant loss of most of the eastern seaboard. Bin Laden rated a bounty of 25 million but was a piker compared to the death and destruction being wrought by global warming. Oddly enough both he and it derived their succor from the same source. A source that needs to be purged. Preferably such a purge will be legisltate but as another UN Climate Change Conference lurches towards inaction it becomes increasingly likely that it will take climate inspired vigilantes to ride to the planet’s rescue. An atomic bomb explosion per second - nightmare or opportunity? If a quarter of the heat of warming can be offset by moving cooler water into deep water at the sites of deep water formation, all of it can be moved to depths of 1000 meters through heat pipes and heat engines to produce energy the planet needs. Mankind is desperately in need of a major upward surge and global warming is the challenge and opportunity of our century. Bionic Mushrooms, an Emerging Form of Clean Energy? A team of researchers led by Manu Mannoor and Sudeep Joshi from Stevens Institute of Technology have now generated bionic mushrooms patterned with energy-producing bacteria and an electrode network. Their findings were outlined in the American..
A tax on carbon intended to bring about a reduction in carbon dioxide concentrations in the biosphere that fails to produce the desired result is an indefensible misallocation of vital reources.